Is Frank Field's resignation a 'wake-up call' for Corbyn? The decision by Birkenhead MP, Frank Field to resign the Labour whip and, as a consequence, membership of a party he has served for decades, was not that surprising. Field is an ardent Brexiteer, who has defied the whip on a number of occasions, he is under threat of deselection and is experiencing considerable personal abuse from members in his constituency. His decision to call it a day however, underlines a number of issues within Labour, not least the toxicity, the intolerance of anybody who does not offer unthinking fealty to the Leader, the growing anti-Semitism within the party and the undermining and loss of the broad church of left-of-centre opinion on which the movement was built. In a blistering letter to Labour’s chief whip, Nick Brown, Field wrote: “It saddens me to say that we are increasingly seen as a racist party” and added that antisemitism alone would have been enough to prompt his resignation. The MP for Birkenhead, who recently faced a vote of no confidence from his local party over his support for Brexit, highlighted what he called a “culture of nastiness, bullying and intimidation”, saying this was at best ignored and at worst tacitly tolerated. With a number of MPs privately frustrated, and growing rumours that several could resign to sit as independents, or even form a breakaway party, the Ilford MP Wes Streeting said that if the leadership failed to get a grip on the issue, Labour could face an existential crisis. Field has become the third Labour MP to sit as an independent, after John Woodcock and Jared O’Mara separately resigned the whip over the party’s handling of misconduct claims against them. The Guardian says that shadow justice secretary, Richard Burgon, believes that Field’s resignation should trigger a byelection in the safe seat, which the MP held with a majority of more than 25,000 in last year’s general election. It's funny how no senior Labour figure is suggesting that there should be a by-election in Sheffield Hallam, where the Liberal Democrats would be likely to regain the seat from Labour. There is a very disturbing report in the Independent, which quotes research from the Chartered Institute of Housing in claiming that low-income tenants are having to choose between eating, putting on the heating and paying rent due to a freeze in housing benefit meaning that it is failing to cover even the cheapest rents. Renters are facing gaps ranging from £25 a month on a single room in a shared home outside London, to more than £260 a month on one to four-bedroom homes in some areas of the capital, the report states. With those gaps rising to £300 and £3,120 within 12 months, the CIH warned this made it increasingly likely that renters would be forced to choose between paying their rent or buying basic necessities like food and heating. The organisation is now calling on the government to review the policy and end the freeze immediately. Abandoning the freeze on Local Housing Allowance (LHA) for private renters was “essential” in order for low-income families to avoid homelessness, the report's authors wrote. “This report highlights just how much housing benefits for private renters are falling short of the levels needed, leaving many homeless people stuck in a desperate situation and putting yet more people at risk of homelessness," said Matt Downie, its director of policy and external affairs. CIH said the policy was hitting single people aged under 25 particularly hard, because they are only entitled to LHA to cover the rent on a bedroom in a shared home, while the levels of other benefits they may be entitled to, such as Jobseeker’s Allowance, are also much lower. For a government that has expressed an ambition to end homelessness and rough sleeping this report is a particularly telling one. I highlighted earlier this month how one of the biggest causes of the increase in homelessness has been the Government's welfare reforms, in particular issues around Universal Credit. The continuing freeze in housing benefit is likely to make things much worse. Unless they sort out these problems then it will not matter how much money is recycled into rough sleeping strategies. Increasing the supply of affordable housing, restoring housing benefit levels and tackling the many problems being thrown up by welfare reform are essential if people are to be kept off the streets. In an interview with the New Statesman, Sacks, who was the UK’s chief rabbi from 1991 to 2013, said Corbyn had “given support to racists, terrorists and dealers of hate who want to kill Jews and remove Israel from the map”. Sacks condemned Corbyn’s 2013 comments, which resurfaced last week, in which he said that a group of Zionists had “no sense of irony” despite “having lived in this country for a very long time”. The remarks prompted criticism from a number of MPs. In a subsequent statement, Corbyn said he had used the word Zionist “in the accurate political sense and not as a euphemism for Jewish people”, adding that he was now more careful in how he used the term. But Sacks told the New Statesman he was aghast at the remarks, making a parallel with Powell’s infamous 1968 speech, in which the then-Conservative shadow cabinet member was roundly condemned for inflammatory rhetoric about immigration. “The recently disclosed remarks by Jeremy Corbyn are the most offensive statement made by a senior British politician since Enoch Powell’s 1968 ‘rivers of blood’ speech,” he said. “It was divisive, hateful and like Powell’s speech it undermines the existence of an entire group of British citizens by depicting them as essentially alien. We can only judge Jeremy Corbyn by his words and his actions … When he implies that, however long they have lived here, Jews are not fully British, he is using the language of classic pre-war European antisemitism. The Labour leader must already be smarting after receiving an endorsement from Nick Griffin, former head of the British National Party, and David Duke, an ex-grand wizard of the Ku Klux Klan. The Times says that Griffin and Duke issued supportive tweets in response to the video of Corbyn talking about Zionists. This though is a whole new ball game. As the Guardian points out, Sacks is a particularly well-known figure in Britain’s Jewish community, renowned as an intellectual and communicator. However, they add that though he was chief rabbi for the majority of British Jews from the modern Orthodox tradition, he did not represent the significant minority of British Jews from the progressive Reform movement, and he has previously taken some robust stances in support of Israeli policies. Greater media attention and government advertising have boosted individuals’ awareness of their data rights and there is now a more public focus on the accountability of businesses in this area, [commercial law firm] EMW said. What is not clear however, is how many of these complaints have been upheld. Without that information it is difficult to make a judgement as to whether businesses really are struggling to implement the new regulations as the law firm allege, or whether there has just been a heightened awareness of data security amongst the general public leading to a greater number of complaints, many of which are based on misconceptions of the new law. Even after reading this a couple of times I am still struggling to get my head around the idea that Theresa May's Chequer's deal has prompted a surge in Tory part membership, albeit to try and turn the party whose incompetence is delivering a no-deal, hard Brexit, into one that is even more Eurosceptic. The Telegraph says that the increase in Tory Party membership is triggering concerns that the party is at risk from a ‘blue Momentum-style’ takeover among supporters furious with the deal which keeps Britain closely tied to the European Union after Brexit. They quote John Strafford, a Tory grassroots campaigner, who says that the rise in membership comes from former UK Independence Party members who are rejoining because they do not like the deal and want to vote in a leadership contest to replace Mrs May. A survey by The Sunday Times found that more than half of grassroots Tory parties have been flooded with new members, many to oppose Mrs May's plans for Brexit. In the survey, 42 out of 75 local associations reported that they had seen increases in membership, with many noting a change since the Chequers deal was agreed by the Cabinet. Mrs May and 11 other cabinet attendees saw an increase in membership in their local parties. Only two of the 12 voted to leave the EU. Michael Gove’s Surrey Heath constituency saw an increase of 40 members, while Damian Hinds’ East Hampshire association saw membership jump by 42. East Hampshire chairman Anthony Marten said: “I suspect it's about the leadership.” Increases were likely “where the MPs were for Remain but constituencies voted to Leave”. Whether this outbreak in Tory internal democracy matches that in the Labour Party, which swept Corbyn into the leadership, has yet to be seen. However, anything, such as the threat of deselection from the right, that pushes Tory MPs into a more hard line pro-Brexit position cannot be good for the country. I have written enough on this blog about the impact that Brexit is going to have on our economy, on jobs and on our standard of living to have conveyed the sense that I think it will be a disaster. However, what about the rhetoric from the leave campaigns during the referendum campaign that promised us a country freed from bureaucracy, with more money to spend on frontline services? Yes, it turns out that was nonsense as well. What has provoked my latest rant is this article in the Telegraph that reports that Theresa May has ordered officials to start work on a British satellite-navigation system to rival the EU’s Galileo, in a show of strength as Brussels threatens to block the UK from its project. In other words we are going to spend £100 million of public money just to "map out" plans for a post-Brexit UK satellite system. This is despite the fact that the UK has already contributed 1.4bn euros (£1.2bn) to the EU's 30 satellite network, which once fully operational in 2020 will provide an alternative to the US GPS system and be used in everything from smartphones to security-critical military operations. Presumably we are writing off that £1.2 billion and will be spending billions more developing our alternative if, as is becoming increasingly likely, we cannot negotiate access to the European system once we leave the EU without a deal? All of this is up in the air of course and, as the article makes clear, the UK has some aces up its sleeve on this particular system that may enable us to insist on access after Brexit, despite the EU's security concerns. But the story does highlight the complexities of Brexit and why, the insistence by Brexiteers that leaving the EU is straightforward is absolute nonsense. And then there is the bureaucracy. Are we just moving from one bureaucracy to another? Well, much of the European bureaucracy had a purpose, though there is still a strong case for slimming it down and reforming the institutions. What is not clear is the purpose of the 16,000 additional civil servants being taken on to manage the Brexit process. As the Guardian reports, the Brexit Secretary admitted a few days ago that there are already 7,000 civil servants working on Brexit and funding is in place to hire 9,000 more if needed. All of this expenditure is taking place at the same time as key public services delivered by local government and the NHS are being cut back, with some institutions struggling to deliver statutory obligations. If this is what taking control means then you can keep it. The story in this piece on the BBC is very familiar to me, therefore. They report that tens of thousands of callers to the police non-emergency line have hung-up in frustration at long waiting times. A total of 135,389 calls to Welsh police via 101 were abandoned or redirected last year - almost 14% of all calls. In the South Wales police force area, where I live and work, more than 36,600 calls to the 101 line were abandoned in 2017 or redirected. If anybody was under the delusion that Labour's problem with anti-Semites was because of infiltration by undesirables, or even a misunderstanding born of crass insensitivity on the part of the party hierarchy, then the revelation of an historic faux pas yesterday should have disabused them. The problem is neither of these things. The problem is Jeremy Corbyn himself. As The Times reports, a leading Jewish charity has accused the Labour leader of “unambiguous anti-Semitic hate” after he was caught on camera telling a pro-Palestinian event that Zionists in Britain “don’t understand English irony”. It is a speech that appears to portray Jews as an alien culture. In the 2013 speech Mr Corbyn referred to a speech by Manuel Hassassian, the Palestinian Authority representative in Britain. Mr Corbyn said that the envoy’s words had been “dutifully recorded by the thankfully silent Zionists who were in the audience on that occasion and then came up and berated him afterwards for what he’d said. Although Mr Corbyn referred to Zionists, his description was of an immigrant community of long standing in Britain, which he declined to name. As The Times points out, Baroness Chakrabarti, the Labour peer, said in her report on antisemitism in the party, commissioned by Mr Corbyn two years ago, that “Zionist” was a term of abuse for Jews. She said that she had “heard testimony and heard for myself first hand the way in which the word ‘Zionist’ has been used personally, abusively or as a euphemism for ‘Jew’. “My advice to critics of the Israeli state and/or government is to use the term ‘Zionist’ advisedly, carefully and never euphemistically or as part of personal abuse,” she wrote. Mr Corbyn made his comments at Friends House in Euston during an event publicised on the propaganda website of the military wing of Hamas, the Al-Qassam Brigades, which has been proscribed as a terrorist organisation by the Home Office since 2001. A spokesman for Labour said that he was there to support peace. Among the speakers was Daud Abdullah, a former deputy general secretary of the Muslim Council of Britain, who has been accused of calling for violence against Israelis and condoning attacks on British troops. Stephen Sizer, a vicar who has suggested that Israel was behind the 9/11 attacks, also spoke. In the light of these incidents it is no longer enough for Corbyn's spokespeople to trot out the line that “Jeremy is totally opposed to all forms of antisemitism and is determined to drive it out from society." He needs to apologise in person for his past actions and then take decisive action to drive out racist and anti-Semitic speech and behaviour from the Labour Party altogether, including adopting the unamended international definition of anti-Semitism. Today's publication of UK Government plans for a no deal Brexit was meant to reassure us, but as the Independent's Economics Editor, Ben Chu comments here, the reality is that they have exposed how isolated and vulnerable we are outside of the European Union. The reality, he says, is that so much would be entirely out of ministers’ hands, leaving us at the mercy of decisions taken in Europe. For as [Dominic] Raab also admitted today that there’s no guarantee the EU would reciprocate on fast-tracking UK exports through their own ports without checks. Where would these new delays leave UK exporters? British farmers? Multinationals with cross-border supply chains? “Who is credibly suggesting, in a no deal scenario, that the EU would not want to continue to sell food to UK consumers?” asks Raab, addressing the fact that sandwich makers have warned about major disruption to supplies in the event of no deal. But is he suggesting that the EU would be willing to open up a giant hole in its customs union and single market just to benefit Continental sandwich ingredient exporters? And bear in mind that UK Brexit fanatics have been demanding a total repudiation of the authority of the legal and regulatory institutions of the EU and calling for the unilateral dropping of existing product safety standards. 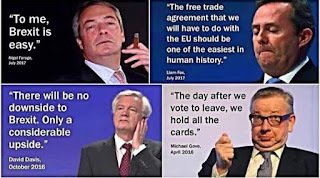 What basis would the EU have for trusting that the UK would stick to the EU regulatory rulebook after a no deal rupture, especially one that has created rivers of bad blood? Raab talks of the “smooth, continued, functioning of business, transport, infrastructure, research, air programmes and funding streams that have previously come from the EU”. But the reality is that so much would be entirely out of ministers’ hands, leaving us at the mercy of decisions taken in Europe. For all their detail, these documents only serve to highlight that gaping void – and catastrophic loss of control. I have seen comments from Liberal Democrats spokespeople that these documents are being put out there to make the Chequers deal seem more palatable. The reality though is that both scenarios would spell a major short term disaster for the UK economy. In the case of a no deal it is almost as if we are being put on a war-footing. But what is increasingly becoming clearer is that it is a no deal that is a far more likely outcome than Theresa May securing an agreement based on the Chequers accord. What a mess. Really good news today with a victory by the Lucy's Law campaign to end the horrors of puppy farming. The Mirror reports that the Government has announced that it will ban the sale of puppies by pet shops, online dealers and other third party sellers. "We will eliminate puppy farming,” he declared in a speech at Number 10, Downing Street. “We will make sure third party sales of kittens and puppies ends. He singled out for praise Brighton vet Marc Abraham, the founder of Lucy's Law, Pup Aid, Care And Respect Includes All Dogs (CARIAD), and Canine Action UK and told the Mirror: “Congratulations on your campaign”. An ecstatic Marc Abraham, said: “I'm delighted with the news that Lucy's Law is finally going to happen. “For years irresponsible breeders in the UK and abroad - puppy farmers - have always used third parties to keep themselves well-hidden from the buying public. “By banning third party sellers, Lucy's Law will ensure all breeders are accountable, making it the first major step in tackling puppy farm cruelty. “Lucy's Law is a tribute to Lucy and all the victims of the third party puppy trade; and I thank all my fellow campaigners, supporters, parliamentarians, celebrities and ethical animal welfare organisations for their help in protecting the future health and happiness of this country's dogs and cats." This is a fantastic step forward and all credit to the campaigners who have fought so hard to achieve this result. She may have married him but it is not fair to judge the First Lady of the United States by the standards set by her husband. She is clearly her own person and is starting to assert that individuality in the role she has been shoe-horned into. Nevertheless, one does have to wonder if sometimes her words and actions are meant to hint at her disapproval of some of the Presidents more extreme habits. She is aware that an army of experts have analysed her every move since last year's inauguration. They have interpreted her body language, pored over her statements and drawn conclusions from her absences. Nobody however, knows what is really going on. There are times though when reading between the lines throws up some interesting conclusions. Thus Melania's speech at a federal conference on cyberbullying in Maryland has drawn attention for all the right reasons. The First Lady did not directly mention the president and his aggressive use of Twitter to berate his foes and call them names, and she may well have not been conscious that there is a read-across, but it is nevertheless embarrassing for Donald Trump that his wife has been so publicly critical of the sort of behaviour he indulges in daily. Kudos to her for using her position to campaign for a better deal for young people, despite the policies of her husband. Is a no-deal Brexit edging closer? The Independent reports that the government is to begin publishing its Brexit technical notices, setting out the consequences of crashing out of the EU without a deal, on Thursday. These documents are designed to inform citizens and businesses how to cope with a no-deal scenario. They say that all 84 of the notices are due to be published before the end of September. Some are thought to be broad in scope, covering issues like financial services, company law and climate change, while others will focus on specific problems including travelling abroad with pets. Apparently, this is preparatory work (which is reassuring) just in case the UK fails to reach agreement in talks with the EU over the next few months. What will be of interest though is exactly what the cliff edge of a no deal looks like, and to what extent the dire consequences of such a scenario can be ameliorated. Just as interesting will be the compromises that will need to be made so as to make a no deal more workable. Will these be acceptable to the Brexiteers. With the likes of Jacob Rees-Mogg threatening to block the government's plans and with a growing clamour for a confirmatory referendum, the Prime Minister is stuck between a rock and a hard place. The publication of these plans could be the trigger for a renewed assault by both sides and a signal to the public that the worst case scenario of a no deal is likely after all. There may well be elements amongst the Labour leadership who understand the damage the anti-Semitism row is doing to their party and are trying to find a way to back out of the mess that they are in. However, if that is the case then their colleagues are doing them no favours. The Independent has been told that, in particular, Labour wanted the omission of references to high-profile cases like that of Ken Livingstone, who claimed Hitler had supported Zionism, and Naz Shah MP, who was suspended over a series of posts including one which appeared to endorse a suggestion that Israelis be deported to the US. In a letter seen by The Independent, the JLM’s chair told Labour general secretary Jennie Formby that the party had been acting “in a manner to deliberately undermine” Labour’s only affiliated Jewish group and “add to further tension”. The party declined to comment on the record on the issue and is yet to confirm an alternative course provider has been found. The withdrawal of JLM comes as Labour’s crisis shows no sign of abating, with a former MP suspended from the party this weekend and a survivor of the Munich massacre accusing Mr Corbyn of being an “antisemite”. The usual rule in these cases is, if you are in a hole, stop digging. Somebody should tell them. It is not often nowadays that a newspaper article shocks me, but this one in yesterday's Guardian did exactly that. The paper reports that data they have obtained under the Freedom of Information Act reveals that the Home Office has left some people waiting more than 20 years for decisions on their asylum claims. Asylum seekers are not allowed to work while they wait for a decision on their claim. They are provided with an allowance of £37.75 a week. There are reports of people forgoing meals in order to afford phone bills so they can communicate with their families in their home countries, being forced to travel everywhere on foot, including to meetings with solicitors and to charities, or going without winter clothing. The Home Office provides accommodation, most often a room in a shared house with other asylum seekers, but lodgings have routinely been criticised for being of poor quality, having infestations of rats, mould and bedbugs and being located in the poorest parts of towns and cities. In a damning report last year, Yvette Cooper, the chair of the home affairs select committee, said asylum seekers’ housing conditions were disgraceful. “Forcing some people to wait more than 15 years for a decision on their asylum claim while banned from work and living below the poverty line is utterly barbaric,” said Stephen Hale, the chief executive of Refugee Action. Of the decisions the Home Office made in 2017, 18,189 or 75% were taken within six months of application, 2,832 took between six months and a year, 3,059 between one and three years, and 243 between three and five years. Of the 40 people who waited more than five years to receive an answer, seven were granted asylum or another protection visa, 22 were refused and 11 either withdrew their application, left the country, or died while waiting for a decision. They came from a range of countries, including Afghanistan, the Democratic Republic of the Congo, Eritrea, Somalia and Yemen. Of the initial refusals that went to appeal last year, 35% were overturned by a judge. For some nationalities the rate of successful appeals was above 50% and for Yemenis the figure was 70%. The Guardian adds that the Home Office has a six-month target for deciding on asylum claims it deems as “straightforward”. However, a report by the chief inspector of borders and immigration last year revealed that almost half of the claims lodged were classified as “non-straightforward”, exempting them from the six-month target. As a result many asylum seekers are forced to live in abject poverty for long periods of time, forbidden from working, having to survive on a little over £5 a day, many being treated for anxiety and depression, isolated and excluded from much social interaction and support. A humane system would seek to avoid this by processing applications and any appeals expeditiously so that at least those seeking asylum know where they stand and can deal with that accordingly. Surely it is time the UK Government addressed this. Labour received another blow yesterday when one of its most high-profile supporters announced that he could no longer support or vote for them because of their stance on Brexit. As the Mirror reports, Sir Patrick Stewart, who has starred in Star Trek and the X-men franchise as well as many more classical roles, says he probably won’t vote Labour again because of the direction Jeremy Corbyn has taken the party. Professor Xavier (as I now think of him) has been a Labour supporter since 1945 when he was 5 years old. Sir Patrick's thinking on this reflects that of many former Labour supporters. He says he finds it “difficult to understand what Labour really stands for or what it represents right now. It doesn’t feel like my party any more.” He told the New European he could not vote for the party so long as it supports Brexit. And he questioned Corbyn’s motives for backing our exit from the EU. He said: “I am not a politician and I am not a strategist, but I have a suspicion Jeremy believes a disastrous Brexit would benefit him politically, and, in all the chaos and confusion that would occur after the policy is implemented – in either a hard or a soft way, I might add – he sees himself taking power. It seems to me to be just plain wrong to play with the country’s future in this way. “What Jeremy doesn’t appear to understand is that it would be the easiest thing in the world to attack the government on Brexit and to oppose it at every turn and to tear apart their arguments and expose it for what it is. Time for Labour to rethink its decision to back the Tories on Brexit perhaps? Boris Johnson is not afraid of controversy. In fact he actively courts it. The dishevelled, bumbling, obfuscating figure he projects is a carefully nurtured act designed to throw people off guard, get him through awkward situations and endear him to others. It raises his profile and keeps him in the 'game' as a potential future Prime Minister. His problem is that when looked at in the cold light of day, his past behaviour and record do not stand up to scrutiny, not least in any evaluation of his fitness for high office. What may be concerning his constituents however, is his failure to follow through on clear election promises that directly impact on their quality of life. Some may consider that a clear betrayal. I am referring of course, to his promise to lie down in front of bulldozers to prevent a third runway being built at Heathrow airport, close to his Uxbridge constituency in west London. He has not yet been given the opportunity to come good on that pledge, but he has betrayed those he represents on this issue in a more mundane fashion, by failing to turn up to vote against it in the House of Commons. Instead, Boris took advantage of his position as Foreign Secretary to jet off to Afghanistan for a day, where he met the president, Ashraf Ghani, and had lunch with the deputy foreign minister, Hekmat Karzai. As John McDonnell, the shadow chancellor, said, Johnson “scuttled out of the country at the taxpayer’s expense rather than honouring his promise to his constituents”. We now know, thanks to this article in the Guardian, that the cost of flights and visas for the three members of staff who accompanied the then foreign secretary on his trip was £19,366. There were no hotel costs, as the visit lasted only one day. The government has refused to disclose the cost of sending Johnson on the visit, saying the information would be published “in due course” on the Foreign Office’s website. Contrast this behaviour with other Government ministers. Greg Hands, another senior Conservative with a London constituency, resigned as a trade minister so that he could honour a promise to his constituents that he would vote against the government’s Heathrow plans. 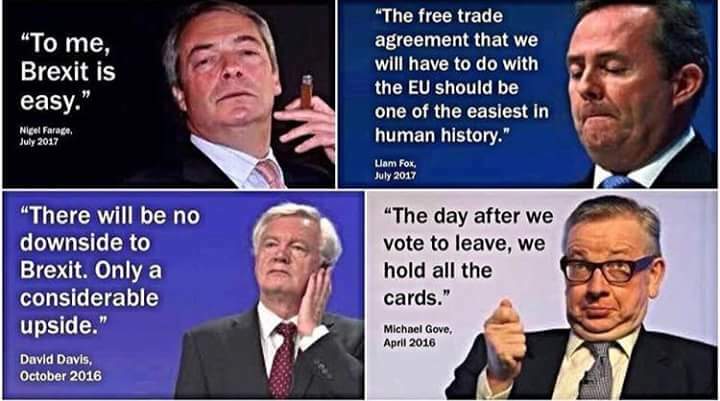 It is little wonder that honourable politicians like former attorney-general Dominic Grieve, have said they could not remain members of the party if Johnson became leader. It is some time since a senior politician stormed out of an interview with a reputable journalist. It is not the sort of thing I expect to happen on the BBC anymore, following their peculiar redefinition of balance, which seeks to reclassify facts as opinions and places good journalists in the impossible position of trying not to offend anybody. Kudos then to Wales on Line journalist, Ruth Mosalski for her robust and challenging interview with the new Welsh UKIP leader, Gareth Bennett, in which she sought to have him justify some of his more controversial views. 1. He was previously banned from speaking in the Assembly after saying there had to be a limit to transgender rights or there would be a "total implosion of society". 3. That the burqa is part of an "alien culture" and parts of the Cardiff suburb Canton were like "Saudi Arabia"
5. Plaid and Labour are pushing Wales towards a "Stalinist Police State"
6. The 2011 referendum giving the Assembly law-making powers was a "con trick" and most recently that the Assembly should be scrapped. RM: "On Friday I interviewed a young lady called Sahar. She's in her 30s, she's Welsh and has lived in Cardiff all her life. She told me she chooses to wear a face veil in the way I chose to wear high heels sometimes. Why do you believe it's not her choice to decide what she wears?" GB: "I believe that if every person took a choice on what to wear, would there be any limits on what they did. What if you went outside the house naked? Would that be ok?" RM: "It depends if I cause offence to someone, the criminal offence is whether I cause offence to someone." RM interjects "in a criminal sense". GB: "If it wasn't against the law it would be ok then, would it?" RM: "The other week in Cardiff there was a nudist bike ride. The reason things like that are allowed to happen is it's not causing public offence. Can we go back to the question. Why is Sahar allowed to choose what to wear, and I am, but she's wrong?" GB: "Will you allow me to answer your question? RM: "If you answer it." GB: "Will you listen. Will you actually try learn something?" RM: "Please don't patronise me. What's your answer to that question?" GB: "Right, you are a useless interviewer, you come in here with preconceived opinions and ideas, you have no ability to engage with the argument, and that was the worst interview I've ever had since [chief reporter Martin] Shipton, who also works for your organisation." RM: "You're an elected individual and we'd really like to finish this interview." GB: "No, absolute rubbish Ruth. In many ways it does not matter whether one agrees with Gareth Bennett on the burqa or not. This is about holding politicians to account and getting them to explain their opinions and public statements. Communication is part of the job description. The Welsh UKIP leader cannot continue to avoid explaining his views, especially if journalists stand up to him as Ruth Mosalski did. She has set the standard for future political interviews in Wales. Will others follow suit (and not just with the UKIP politicians)? Just when we thought that the UK Government was taking homelessness and rough sleeping seriously with the announcement of a £100 million strategy to "help people turn their lives around", including support for mental health and addictions, along comes reality to burst our bubble. The Times reports that housing secretary, James Brokenshire has admitted that none of this is new money. Apparently, half the cash had already been committed to rough sleeping and the other half was “reprioritised” from existing budgets in his department. So that means no budget consequential for the Welsh Government. Of course this initiative had always been window-dressing, with the rather less than ambitious target of ending rough sleeping within a decade being unattainable whilst the UK Government continue to treat the issue as a standalone problems. One of the biggest causes of the increase in homelessness has been the Government's welfare reforms. Until they understand that and make the necessary changes then more and more people will find themselves being evicted from their homes. Instead the housing minister is in denial. And of course, although the changes that have been announced are welcome, the Government still needs to tackle the chronic lack of genuinely affordable homes, the deep instability of renting, as well as the problems with housing benefit that are leaving so many without a home. I would also say that throwing money at the problem is not always the solution, even if it were new money. The Housing First approach being pioneered in places around the UK, including Scotland seems to be a good way forward. This places a homeless person in a home first and then adds the support, including help with drug and alcohol abuse, mental health and how to manage a tenancy. There was no sign that the UK Government had embraced the Housing First approach yesterday, nor that they were prepared to put in place the sort of resources and joined-up government needed to make it work. By far the most shocking international story of last week was not the revelation that Donald Trump had initially asked to be sworn in over a copy of 'The Art of the Deal' rather than the Bible, or even the allegation that he frequently uses the 'N-word', but the way that Canada has been left isolated by Western democracies over their criticism of civil rights abuses in Saudi Arabia. On June 6, Saudi authorities arrested the writer and activist Nouf Abdelaziz, who had publicly expressed solidarity with three women’s rights activists arrested in May, along with at least 14 other activists and supporters. On June 10, the authorities arrested Mayaa al-Zahrani, an activist and friend of Abdelaziz, after she reportedly posted a letter Abdelaziz asked her to make public in case of her arrest. In the letter, addressed to her fellow Saudis, Abdelaziz explained who she was, stressing that she committed no crime: “I am not a provoker, not a vandalizer, not a terrorist, a criminal or a traitor… I have never been [anything] but a good citizen who loves her country and wishes for it nothing but the best.” Both women are being held incommunicado. Okaz earlier reported that, 15 days into the activists’ detention, an investigating body had announced that all nine detainees had confessed to the latter two accusations. If convicted, they could face up to 20 years in prison. And yet when the Canadian Government criticised these arrests not one major Western nation came forward in their support, whilst two of Ottawa’s closest allies, the USA and the UK, called for restraint. The West has sat back whilst Riyadh expelled Canada’s ambassador, recalled its own envoy and froze all new trade and investments. Riyadh also said it will relocate thousands of Saudi students studying in Canada to other countries, while state airline Saudia announced it was suspending flights to Toronto. Justin Trudeau is standing firm, saying: "Canada will always speak strongly and clearly in private and in public on questions of human rights." But why are the Western nations, so-called defenders of democracy and liberty so silent on this issue? Like so many things in politics, it all boils down to the money, said one expert. “There is an attempt by the Saudis to create some fear and rattle some of those Western governments into not supporting Canada because they may be cut out or shut out from some potential Saudi economic deals and the big boom that it’s undertaking,” said Bessma Momani, a professor at the University of Waterloo specializing in Saudi relations told Global News. The US has also refused to get involved and called both countries close allies. “Both sides need to diplomatically resolve this together. We can’t do it for them; they need to resolve it together,” US State Department spokeswoman Heather Nauert said Tuesday. The European Union also preferred to not get involved in this high profile issue. “We don’t comment on bilateral relations” and that “we are in favor of a dialogue,” said EU spokesperson. The position of the UK Government and the EU in particular on this issue is a disgrace. The West has long offered succour to the Saudis, despite their near-medieval treatment of women and the restrictions they impose on their citizens. That is one of the reasons why they have got away with it for so long. Surely it is now time to get off the fence and back the principled stand being taken by the Canadian government. Many people have criticised Theresa May's blunt and uncompromising approach to immigration and the debilitating effect it is having on the economy and our public services, but surely even she must listen to the latest comments from the CBI. As the Guardian reports, the Confederation of British Industry has urged Theresa May to drop her “blunt target” on immigration numbers and introduce new freedom of movement rules for EU citizens post-Brexit to ensure firms, large and small, can stay in business when the UK leaves the bloc. They have called for new rules for EU citizens to keep open the pipeline of migrant workers in all sectors including agriculture, hospitality, construction, the NHS and the creative industries; and an easing of the policy for non-EU workers to give small businesses, unable to afford the visas or deal with Home Office red tape, a chance to plug any gaps arising from Brexit. “Openness and control must not be presented as opposites. Public attitudes towards migration and the impact it has on communities are far more nuanced,” said CBI Deputy Director General, Josh Hardie. “Scrapping blunt targets, ensuring all who come to the UK contribute and using the immigration dividend to support public services will add to public confidence,” said Hardie. While recognising that immigration “has also given rise to legitimate public concern about the pressure it creates on public services and on society”, the report says leaving the EU will mean “momentous change” for business which should be addressed properly by the government. The implications of the report are wider however. It has relevance to our current status within the EU, to the damage that 8 years of excessive curbs on migration have done to our economy, and it also refutes many of the arguments on which the Brexit referendum was won. In particular, the report says that shifting the tone of the debate to focus on the positive benefits of migration will help build public trust. The CBI argues that immigration has “delivered significant economic benefit to the UK” over the past 50 years and maintaining access to people and skills is “a high priority for business in the UK as it prepares to leave the EU”. I cannot help but get the feeling that these conclusions have been mooted two and a half years too late. If only the remain side had been so positive during the referendum campaign. Have UKIP in Wales pressed the self-destruct button in their choice of Welsh leader? If it is clear alternatives voters are after in elections, then UKIP's Welsh members have certainly given it to them in spades with their choice of the person to lead the party in the Assembly and, if he survives that long, to represents them on the stump in 2021, when we next elect AMs. As the BBC report, Gareth Bennett, the controversial UKIP member for South Wales Central has won a three-way battle to lead the party in the Senedd. He becomes the fourth leader of UKIP in Wales since the 2016 assembly election, which considering they started with a group of seven is pretty good going. UKIP ordered the ballot of nearly 900 members in Wales to settle a row sparked when Caroline Jones ousted former Tory MP Mr Hamilton as group leader in May. Mr Bennett beat Mr Hamilton by 269 to 193 votes in the second round of counting. Ms Jones, who was leader for just six weeks, was eliminated after the first round with 130 votes. She is now questioning her future in the UKIP group, such as it is. They were so divided that they were apparently struggling to even hold meetings. What this means for UKIP in Wales has to be seen. Bennett is not just a controversial figure, he is widely considered to be bigoted and offensive. He went on the record in the run-up to the Assembly elections in blaming migrants for the litter problem in Cardiff. He was banned from speaking for a short period in the Assembly chamber for making transphobic comments. He told a constituent to get a life and move to Venezuela and invited Donald Trump to open his constituency office in Pontypridd, arguing that he and the then President-elect “had a few things in common”. He is publicly in support of abolishing the Assembly and having Wales ruled directly from London, as seen in his leadership manifesto. There is no doubt that these views will appeal to some voters, particularly if they are being advocated by a charismatic and articulate leader, but Gareth Bennett has neither of these characteristics. UKIP's travails are likely to continue. I am back after a week in Snowdonia and North Wales and nothing appears to have changed. Boris Johnson is under investigation for insulting and racist remarks about Muslim women, playing the Trump-spark-outrage-for publicity card in his bid to succeed Theresa May, whilst Jeremy Corbyn is still aiding and abetting the Tory hard Brexit by refusing to acknowledge and back the increasing demand for a final referendum on any deal the UK Government can negotiate. In these circumstances, when there is no majority in the House of Commons for a way forward, and with opinion polls showing that the public want another vote, the most logical stance for the official opposition would be to press for that plebiscite to take place. The Guardian reports that major new polling of 10,000 people suggested Labour voters back a second referendum by 63%, with just 8% opposed, in one of the largest surveys of public opinion since the referendum to leave the European Union. The research by the People’s Vote campaign, which supports a referendum on the final deal with the option to remain, suggested Labour voters would back staying in the EU by a margin of three to one if the poll was rerun. In addition about 130 constituency Labour parties are understood to have expressed willingness to back a motion in favour of a second vote, drafted by the pro-Corbyn campaign group Labour for People’s Vote. And yet, instead of embracing the opportunity to debate a way forward the Labour leadership are seeking to stifle the motion. So much for the democratic process and open debate that Corbyn had previously embraced and on which he built his backbench career. According to Buzzfeed, the Liberal Democrats are planning to embrace some of the reforms that proved so successful for the Canadian Liberals by allowing non-members to vote in the party’s next leadership contest. They add that this could also see a political outsider, like Brexit campaigner Gina Miller, take the helm as Leader for the first time. The website says that the party (or at least those doing the briefing, as this has never been discussed by the party) hope that the move will boost our profile and appeal to millions of floating voters who feel the centre ground has been abandoned by the two main parties. These same insiders are also telling journalists that an open leadership contest is the party’s best chance of reviving its dwindling fortunes amid the turmoil of Brexit negotiations. Apparently, there has even been suggestions that the party needs to change its name in a bid to appeal to a new wave of voters, but briefings now say this is unlikely to happen. Surprisingly (or not), those anonymous and unaccountable individuals who are feeding this to journalists in the hope of bouncing the party into change, are not well-organised enough to get the matter on the conference agenda for next month. Instead they are relying on a fringe event to promote their ideas. Personally, I can see nothing wrong with a registered supporters scheme, and even giving those who sign up to it a vote in selections and for the party leader. However, the election of a non-MP as leader, no matter how charismatic or well-known, would be a fast-track to irrelevance and media oblivion. Just see how well it has worked out in Wales, where despite having a very energetic and active leader our media presence is zero, and her name recognition amongst even politically aware people is non-existent. Just how difficult it is to get yourself heard in the media is illustrated by the limited exposure Vince Cable is able to secure, despite the fact that he is an erudite and substantive former Cabinet Minister with a distinctive message. And therein lies the problem that these reforms will fail to fix. The Canadian Liberals were a long-standing party of government in a three party system where they already had a substantial base. They also controlled a number of regional governments before they came back to power nationally. The UK Liberal Democrats are none of those things. We have traditionally been a party of protest votes, and when we entered government we made enough mistakes, amongst our many accomplishments, to alienate a lot of our former voters. There are no quick fixes in UK politics. It takes time to re-establish yourself after the sort of setbacks we suffered in 2015 and 2017. It takes time to re-establish trust and prove that we can continue to deliver the sort of radical and distinctive policies we are known for. And yes, we are the only pro-Brexit party who should be getting more support from like-minded people, the forty eight per cent. But, until we have overcome the trust issue and put our governmental legacy behind us that is not going to happen. Those looking to make changes in the hope of transforming the party overnight are deluding themselves. We have been there before and each time it is the party's values that suffer as we are subjected to bland messages and see valuable resources thrown away needlessly on poorly conceived campaigns. As a grassroots party, who have to work harder than any other politicians, to achieve electoral success and to get things done, we need to understand that there is a route back, but it will take time and patience. As somebody who has been a Liberal and a Liberal Democrat since 1974, I can testify that not only have we been in this situation before, but we have pulled ourselves out of it and built the party back up. My one plea though is can we make sure that we have solid ideological and organisational foundations this time, so that we are better prepared for the next slump in support. Oh, and can we give up on these briefings about off-the-wall get-rich-quick schemes by anonymous apparatchiks sitting comfortably in the Westminster bubble, and actually get out on doorsteps where we can work to earn our revival. The National Institute of Economic and Social Research (NIESR) has published its calculation of the price of the prime minister’s Chequers proposals, which they say would weaken economic ties and cost us £500 a year each. They add that if we leave with no deal, then each individual will lose £800 a year. As the Independent reports, the NIESR study warned the UK economy was on course to grow at its weakest rate since 2012, even if it retained nearly full access to the EU for its goods and services. The problem is that the white paper that followed Chequers only seeks to protect goods by maintaining alignment with the EU, while excluding services, even though they make up 80 per cent of the UK economy. They add that their estimates do not include the likely impact on productivity which could, on some estimates, double the size of the losses. The NIESR predict that the UK economy will grow by 1.4 per cent in 2018 and by 1.75 per cent in each succeeding year, but only if close to full access to the EU is retained. With the Foreign Secretary, Jeremy Hunt suggesting that it is now inevitable that the UK could come crashing out of the EU without a deal, these figures begin to look more and more realistic. The NIESR report underlines the consequences of the chaos which still prevails at the heart of the UK Government. Instead of sitting down with the EU from day one to protect our interests, the Tories have relentlessly and fruitlessly pursued the undeliverable promises on which the Brexit referendum was won, have failed to articulate any clear vision for what a post-Brexit UK will look like and have catastrophically messed up the whole process in a glorious cacophony of infighting and blood-letting. The failure of the official Labour opposition to highlight these failings and to try and force the Government's hand has been complicit in this fiasco. Labour have been too busy propping up Theresa May and her Brexit fantasy to be able to see the damage it is doing to the country. Jeremy Hunt seeks to pin the blame on the EU, but at least Michel Barnier had a coherent negotiating position with clear red lines. That is something the UK Government still lacks and, we will have to pay the price for that. Freemasons to admit women - but there is a catch! Headlines are designed to grab our attention and draw us into the article, but rarely are they so successful in that endeavour as this one in The Times. The paper reports that the Freemasons are to admit women, but only if they first joined as men. This secretive society, which has been male-only for centuries, is to relax its rules. The United Grand Lodge of England, founded in 1717, has issued guidance to its 200,000 members that “a Freemason who after initiation ceases to be a man does not cease to be a Freemason”. The paper tells us that the Freemason's “gender reassignment policy” says that anyone wishing to join must be male but once admitted can remain a member as a woman. Anyone who has become a man can also apply. Some conventions remain. Formal greetings should begin with the prefix “Brother”, so someone who has transitioned from John to Jane Smith would be “Brother Jane” or “Brother Smith”. Appropriate alternatives to the dress code, which could include a “smart dark skirt and top”, would be allowed. The reasons for this 'liberal' approach to membership though, may lie more in legal advice than in respect for the gender choices of the society's members. Under the Gender Recognition Act 2004 and the Equality Act 2010 a man who has joined the Freemasons cannot be excluded after becoming a woman because gender reassignment is a protected characteristic. Without any intended disrespect to transgender individuals, you really could not make this stuff up. Would it not be better if the Freemasons just abolished all rules about gender altogether?